(Newser) – Before you break out the snow shovel this season, doctors say there are a couple of things to keep in mind lest clearing your walk turn deadly. At least two people died from heart problems while shoveling snow this week in Buffalo and about 100 Americans meet the same fate each year, the BBC reports, as a boosted heart rate and artery-constricting cold air make "a perfect storm for a heart attack," a doctor explains. If you're over 55 or "habitually sedentary," he says you shouldn't pick up a shovel at all. 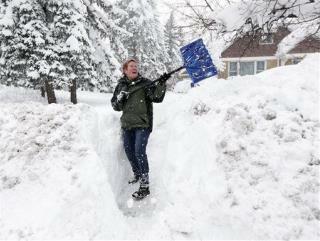 Shoveling snow is also risky for smokers and people with coronary disease. But if you have to shovel, remember to breathe during the exercise. Push the snow, don't lift it, and avoid the 6am to 10am window if possible as hormone levels make people particularly prone to heart attacks at that time. Petite, weak, full of arthritis, and disabled, I can shovel heavy Lake Effect snow. Just have to take my time, because I get winded (ex-smoker). I'm on old age Social Security, but was on disability before retirement. TV expose stories claiming people aren't disabled, because they're seen doing such and such, irritate the hell out of me. My arthritis makes it impossible for me to sit, stand, or walk for more than an hour or so. Also, I can't use my hands or arms very long, especially for fine motor skill tasks, and I have poorly controlled migraines, so maybe I can work, if I'm having a good day (or maybe not, because I'm having a migraine). My arthritis comes in flares, and some days are worse than others. Towards the end of my career, I was in and out of outpatient surgical centers pretty regularly for dangerous spinal injections of corticosteroids into my neck, just so I could prop myself up at a desk and continue to work. Each injection held the risk of paralysis or death. Yes, everyone gets arthritis, but people in my family start having problems with 'old age' osteoarthritis in their late twenties and early thirties. So the next time one of those jerks on Faux News runs an expose that some city worker isn't disabled, because he was seen trout fishing, or whatever, just remember, he doesn't trout fish eight hours a day, five days a week. If his disability acts up while he's fishing, he can put his rod down, go home, and crawl back in bed with his heating pad and oxycodone. Just a regular square point shovel does great with snow, especially when there's a bit of ice laying on the sidewalk. Bundle up and take your sweet time.